Chalet Alta VistaOriginally uploaded by simmogem. This is Chalket Alta VIsta – what a relief to the normal backpackers we have been visiting! 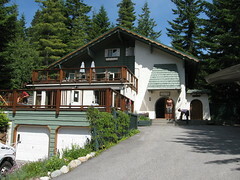 This is our accommodation in Whistler, about a fifteen minute walk from the ski village and only minutes to the lake and Whistler Golf Course. The Chalet is like a big house and very comfortable. We stayed three nights and spent a lot of time lounging about and doing short trips into the ski village. We met some great people here and we were sad to leave. One such person was Craig, a fellow Australian who lived and worked in the Chalet and had actually met Simon three years earlier! Neither recognised one another although we were sure that there was some connection as Craig was from the Illawarra and had a number of friends from the Shire. It was only while Simon and Craig were talking cars (I left them for a second!) that they realised they had met before. Simon mentioned that he lived in Bangor and Craig started to describe someone he once knew who lived in Bagor, described Simon’s street and that this guy owned a Toyota Soarer – it was at this point that Simon realised Craig was describing him! They had met through the Toymods car club and even more bizarre Simon had driven Craig in his car for over an hour once yet still hadn’t recognised him. Craig was able to log onto his computer and show Simon photos of his car! Whistler Village itself was nice, although it is a bit too purpose built. Almost like a theme park for adults. While we were there there was a mountain biking conference on and one of the ski slopes had been converted into a bike park. The golf course (one of three in Whislter) looked very fancy, we could tell by the pretty cool buggys and the fact that all the people there looked like they were straight out of Miami Vice – very white teeth. Whistler is a mixed bag of backpacker and rich – you know which camp we are from. I really enjoyed Whistler and even though it is summer there was still plenty to see and do.